The glittering second edition of the Kabaddi World Cup took off in style today with the attraction of the evening, Bollywood star Shah Rukh Khan promoting the game and his latest movie Ra.One. SRK to become kabaddi brand ambassador? Speaking at the inaugural ceremony of the Kabaddi World Cup, Deputy Chief Minister Sukhbir Singh Badal said that SRK used to play kabaddi as a young schoolboy. The multipurpose sports stadium, where the opening ceremony for the Kabaddi World Cup is being organised, is giving sleepless nights to the people living in the nearby areas. Situated in the heart of the city, the stadium is surrounded by thickly populated areas like Aggarwal Colony, Minocha Colony, Chandsar Basti and Ghanaiya Basti where some private and government schools are also located. With nearly 2800 policemen deployed around the multipurpose stadium and barriers installed on all roads leading to it, traffic moved at a snail's pace in the city today. Three public places including a government school, a gurudwara and the Peerkhana near the stadium remained out of reach for the people since morning. While the Guru Harkrishan Public School and the junior wing of the Delhi Public School were closed for the day to accommodate the vehicles of the VIPs and VVIPs, students at the Government Elementary School at Ghanaiya Basti, adjoining the stadium, attended their classes amidst the presence of heavy police force. An unusual calm prevailed today in the corridors of the local Mini-secretariat here as the senior officials remained busy making arrangements for the inaugural function of the Kabaddi World Cup at the Sports Stadium here. “The governments should formulate plans to promote the rural games which could not cross the boundary of the villages,” said Dalip Singh Rana aka The Great Khali, who was in Bathinda to be a part of the inaugural ceremony of the World Kabaddi Cup-2, where he was one of the guests. Notably, he has not demanded any money in return of his performance in the ceremony. He said, “Being a sportsperson, I have come to promote the game and not to earn money.” Khali had struggled a lot before entering the World Wrestling Entertainment (WWE), which made him famous worldwide. The committees have been announced for the 33rd Prof Mohan Singh Mela slated to be held from November 4-6. Making an announcement, president of the Mela Committee Jasvoir Singh Grewal and general secretary of foundation Kulwant Singh Lehri said the chairman of the welcome committee is in-charge of the SAD (Bathinda) Sarup Chand Singla while president, welcome committee, is Mayor Baljit Singh Birbehman. Bathinda Civil Surgeon Dr Iqbal Singh has sent a letter to the Director, Health and Family Welfare, Punjab, to make a liaison with the epidemiological team of the PGI, Chandigarh, for conducting a survey regarding the spread of dengue in the city and its bad effects. The civil surgeon has also urged the director to make arrangements to send the epidemiological team to Bathinda. Vishwa Hindu Parishad and other like-minded NGOs today opposed the participation of the Pakistan kabaddi team in the second World Cup Kabaddi. The multipurpose sports stadium reverberated with Punjabi and Hindi songs wherein dancers performed at the inaugural ceremony of the 20-day event that promises to be action packed. From 3 pm onwards, kabaddi fans started occupying their seats. More people were at the stadium to have a dekko at King Khan rather than to cheer their respective kabaddi teams. Fourteen teams of men and four teams of women are participating in the event. All the teams were introduced to the audience in the parade. The colourful evening gained impetus when King Khan arrived at the venue at around 7:45 pm. Not leaving any stone unturned, Shah Rukh greeted the audience in his Akon-sung "Chhammak Chhalo" song style. Seated between the Chief Minister Prakash Singh Badal and Deputy CM Sukhbir Badal, King Khan first remained busy talking to the Senior Badal and then shared pleasantries with Sukhbir. The cultural evening started with Nachhattar Singh Gill followed by Miss Pooja and then Shah Rukh took over the stage. Delivering dialogues from his films like "Bazigar" and "Devdas", he tried to impress the Punjabi audience with frequent cries of "Bole So Nihal." Sukhwinder joined him on the stage for the performances. A glittering six-minute firework was also on display. The laser shows depicting the history of Punjab and its contemporary aspects left the audience spellbound. The politicians had a tough time playing musical chairs. A Member of Parliament (MP) had occupied the seat since 4 pm. Unaware of the designation of this politician, a commoner asked him to move aside. Irate over this "order", the politician tried to leave the spot. However, president, Punjab Kabaddi Association, Sikandar Singh Maluka pacified the irate politician before taking him back to his seat. While the VVIP and VIP sections was brimming with security forces, to maintain discipline and had standardized seating arrangements, the slots of the common audience was a picture of commotion. Cops, with batons, were present in plain clothes amidst the surging crowd. Police used mild force near gate numbers 4, 7 and 8 meant for the entry of the general public. Enthusiastic players gave a tough time to cops. Show began with the light and sound show. The countdown video shown on the mega screen on all the four sides of the stadium gave the background of the game as the aerial fireworks lit the sky. Against a capacity of 10,000 seats, there was a strong audience of around 20,000. The multipurpose sports stadium, where the opening ceremony for the Kabaddi World Cup is being organised, is giving sleepless nights to the people living in the nearby areas. Situated in the heart of the city, the stadium is surrounded by thickly populated areas like Aggarwal Colony, Minocha Colony, Chandsar Basti and Ghanaiya Basti where some private and government schools are also located. While the families residing in the 50 houses situated in the Aggarwal Colony are forced to stay indoors because of the barricading of the roads leading to the stadium, others are unable to bear the loud noise emanating from the stadium. Families residing around the stadium alleged that they are upset over the nuisance created for making the opening ceremony of the Kabaddi World Cup a success. "The last three days have been the worst. We could not catch even a few minutes of sleep as loud noise emanating from the stadium is disturbing. For the last three days, music is being played at odd hours. The effect of the sound is so strong that the window panes, the entire wooden frame and doors shake with the high decibel noise," said Ashok Khurmi, who resides near the stadium. Khurmi said that there are seven members in his family and they are quite upset for the last few days due to the tight security arrangements made. "Neither could we park our vehicles outside our home nor anyone is allowed to stand in front of our own house," said Sushil Kumar, another resident. There are 52 plots in the colony and 45 houses where more than one family resides. 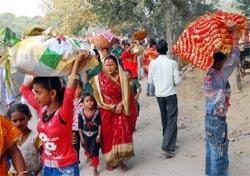 The people added that most of the families residing in houses are down with fever. The children and the elderly are at the receiving end and they have to bear with the terrible noise coming from the speakers installed inside the stadium. Police personnel have occupied the rooftops of the houses for security purposes. A visit to the stadium revealed that the hospital staff, doctors and paramedics were quite upset as they were forced to sit beside the loud-speakers. Vehicles coming from the Bibiwala road, Goniana road, Mansa and Dabwali road towards the city literally crawled since morning. Police officials checking the vehicles at the entry points to the stadium lead to traffic jams. The hapless commuters were seen enquiring about alternate routes to reach their destinations in the residential areas beside the sports stadium. Police cordoned off the areas around the stadium since morning. The Bhatti road, Peerkhana road and streets of the Minocha Colony were blocked in the morning. By evening, gun-toting and stick wielding cops sealed all the other alternate routes leading to the stadium. The areas surrounding the Mittal Mall where Bollywood star Shah Rukh Khan is likely to stop before performing at the stadium, too was cordoned off. Heavy security was deployed around the mall ahead of the superstar's visit. Shopkeepers in the vicinity of the sports stadium said they have not earned even a single penny in view of the tight security. "I failed to get any customer today as the police have blocked the road with iron barricades. They do not allow anyone to take their vehicles towards the road," said Salman, a flower seller on Peerkhana road. He pointed out that only the police vehicles and cars fitted with red beacon are allowed to ply on the road. The district administration and the police claimed that they have made arrangements in such a way that it does not affect the common man and puts the commuters at ease. People, however, alleged that the entire government machinery is used to make the event a success just to please their political bosses. The passengers in the buses and daily commuters had a tough time. While the entry of the heavy vehicles was banned in the city from morning itself, the daily commuters too had a tough time boarding buses from near the Hanuman Chowk, Fauji Chowk and Bibiwala road as the bus services got delayed. No senior police functionary was available for comments as they remained busy with VIP duties. Three public places including a government school, a gurudwara and the Peerkhana near the stadium remained out of reach for the people since morning. While the Guru Harkrishan Public School and the junior wing of the Delhi Public School were closed for the day to accommodate the vehicles of the VIPs and VVIPs, students at the Government Elementary School at Ghanaiya Basti, adjoining the stadium, attended their classes amidst the presence of heavy police force. Pilgrims to the Gurudwara and Peerkhana situated near the stadium could not offer prayers at these places. "Of the eight rooms in the school, one on the first floor has been converted into a wireless control room. Police took over this room to install its own set-up," said the staff members. Even the yard in the front was used for parking police vehicles. "None of the education department officials has passed any orders to close the school. We haven't got any communiqué. But we registered a mere 50 per cent attendance today," said a school teacher pleading anonymity. There are 90 students in the school and apart from the primary wing, the school also has students in classes VI, VII and VIII. There are six teachers. A visit to the school revealed that the students were dancing to the tunes of Hindi songs being played at the stadium. Teachers expressed their helplessness in taking up the matter with any of senior official of the Education Department. "It's the government that is organizing the event and if we make complaints, they would transfer us to a remote place," said one of the teachers. School principal Sher Singh, while admitting to the problems, said they have been trying to teach the children despite the loud noise and the presence of the police. "We have to teach the children with the facilities provided and there seems to be no other way out," he said. Meanwhile, District Education Officer (DEO) HS Sandhu said classes in the school continued till around 2 pm. "Till 2 pm, there was no major activity at the stadium and the children were let off before that," he said. Sandhu added that indeed the cops have been given a room in the school but it did not deter the studies there. As the senior officials were away, their junior staff also took liberty and the offices wore a deserted look today. Due to the hectic activities in the city on account of the Kabaddi World Cup, most of the people on their own did not visit the Mini-secretariat for work while those who did had to return empty-handed as they could not find the officials there. Not only at the Mini-secretariat, the people also faced problems in getting treatment at the Civil Hospital as some doctors had been deputed for the Kabaddi World Cup. Some doctors were also deputed on VIP duties. In the absence of these doctors at the OPD block, patients suffered a lot as they returned from there without getting treatment. Some doctors also performed duties at the 'Referral Hospital", set up in a room on the premises of the emergency block of the Civil Hospital. 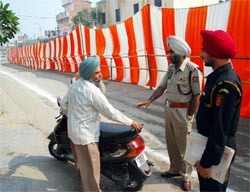 As the entire police force was on duty in different parts of the city and the SSP was also busy supervising the security arrangements, people also avoided visiting the police officials, as they knew that due to the busy schedule, no police official would be available to them even if they tried to meet them. “The governments should formulate plans to promote the rural games which could not cross the boundary of the villages,” said Dalip Singh Rana aka The Great Khali, who was in Bathinda to be a part of the inaugural ceremony of the World Kabaddi Cup-2, where he was one of the guests. Notably, he has not demanded any money in return of his performance in the ceremony. He said, “Being a sportsperson, I have come to promote the game and not to earn money.” Khali had struggled a lot before entering the World Wrestling Entertainment (WWE), which made him famous worldwide. He thundered the wrestling rings with his fights. Even, the world renowned Undertaker could not stand in front of him. The Himachal’s small village lad, who had never expected to be in the international frame started his career in sports with body building, played a lot for India, however, he never got the credit he deserved. However, Khali chose not to blame anyone for this. Khali is still employed with the Punjab Police as a sub-inspector at Jalandhar. It is different that he has no time for his job as he remains in the US for his sport. The seven feet and one inche wrestler has got more than he expected from his life. Despite of being an international celebrity, Khali manages to visit his native place in Himachal Pradesh. He has come all the way to Bathinda from his home, where he came especially from the USA to celebrate Diwali with his family and friends. Chief agriculture officer Paramjit Singh Sandhu and sarpanch Jasmel Singh are the members. Chief coordinator of the foundation committee is Pargat Singh Grewal and coordinator is Sadhu Singh Grewal, Dr Nirmal Jaura and Gurbhajan Gill would also be the part of the event. Main adviser of the economic committee is Kanwar Bheem while chief promoter is Bikramjit Singh Bahia. Sukhvirpal Singh Badiala is president while the general secretaries are Inderjit Singh Bablu and Darshan Singh Mehta. General secretary of the arrangement committee is Jagsir Singh Chhateana while members include Amarjot Singh, Hardeep Singh Mann, Gurinder Singh, Harpreet Singh Harry, Ramnik Wali, Rupinderjit Singh Rimpy, Gurbir Singh, Parminder Singh Pali, Navjit Singh Aulakh, Dr Tejinder Singh, Amritpal Singh Behman, Sukhdev Khan, Gursewak Singh Nandgarh, RajinderSingh Jogi, Gursewak Singh JP, Haryodh Singh, Balaur Singh, Gurmail Singh Jeeda, Naresh Kumar, Major Singh, Harkamalpreet Singh Chhina, Chiman Lal, Surinder Bansal, Amrit Jassal, Gurnaib Singh, Kulwant Singh Gillpatti, Harmail Singh Brar, Kuldeep Singh Sandhu and Gurpreet Singh Gandhad. Treasurers include Bant Singh Dhillon and Rajinder Singh. Convener of the ‘Kavi Darbar’ committee is Satinder Dhanoa. Convener of the seminar committee is Gurcharan Singh, secretary, general Viraj Singh Sandhu, senior secretary general, Gurdarshan Singh Sethi and Veerdavinder Singh. Members of the award committee include Dr Labh Singh Kheeva, Satpal Goyal, Labh Singh Sandhu, Ranjit Singh Grewal and Dr Sardool Singh Grewal. Bathinda Civil Surgeon Dr Iqbal Singh has sent a letter to the Director, Health and Family Welfare, Punjab, to make a liaison with the epidemiological team of the PGI, Chandigarh, for conducting a survey regarding the spread of dengue in the city and its bad effects. The civil surgeon has also urged the director to make arrangements to send the epidemiological team to Bathinda. Meanwhile, the teams of the Health Department and the Bathinda Municipal Corporation today also conducted door-to-door survey for detecting the dengue cases. These teams today surveyed 1,408 houses in the city and detected just 17 fever cases. The teams have so far surveyed 27,909 houses and detected 516 fever patients. The teams have also detected larva, causing dengue, from 141 houses during 23 days survey and destroyed it. The civil surgeon said the teams have also created awareness among the people about the preventive measures. Opposing the arrival of team for the inaugural ceremony today, the VHP workers said the Indian Government should not invite a neighbor that leaves no opportunity of harming India.